64 Commonwealth is located on the south side of Commonwealth, between Berkeley and Clarendon, with 62 Commonwealth to the east and 66 Commonwealth to the west. 64 Commonwealth was built ca. 1872, one of three contiguous houses (62-64-66 Commonwealth). The three houses form a symmetrical composition, with 64 Commonwealth, in the center, a full story higher with a tall mansard roof ornamented with iron cresting. The flanking houses at 62 and 66 Commonwealth are mirror images of each other. Horizontal string courses of stone unify the façade. Click here for an index to the deeds for 64 Commonwealth. On December 2, 1872, 64 Commonwealth was purchased from Henry Bigelow Williams by a real estate investment trust formed by Charles Allen, Isaac S. Cruft, and Charles R. Thayer. The deed included a restriction specifying that no structure could be built in the rear yard any higher than the floor of the dining room, which was six and one-half feet above the sidewalk on Commonwealth, without the permission of the owners of 62 Commonwealth and 66 Commonwealth. Charles Allen was an attorney and served as Massachusetts Attorney General from 1867 to 1872. He later served as an associate justice of the Massachusetts Supreme Judivial Court. Isaac S. Crufts and Charles R. Thayer were merchants. 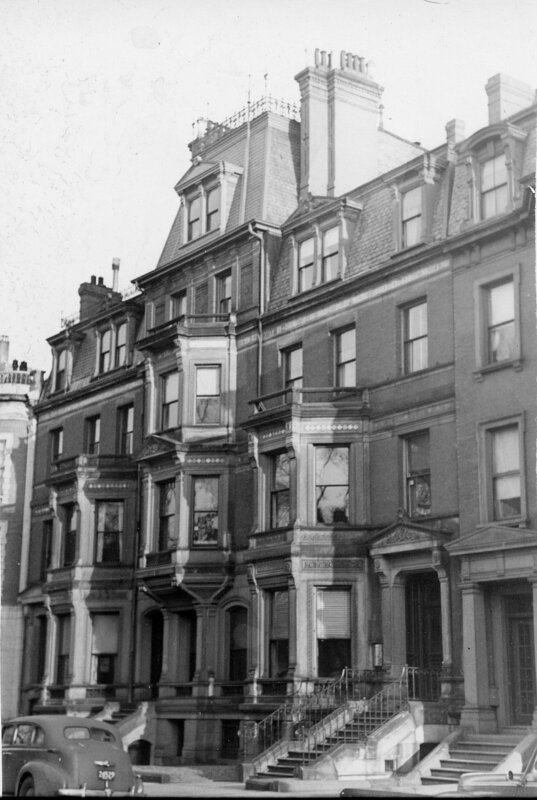 On the same day as they acquired 64 Commonwealth, and probably as consideration for it, Charles Allen, Isaac S. Crufts, and Charles R. Thayer transferred to Henry Bigelow Williams land at the southeast corner of Boylston and Clarendon where he subsequently built the Brunswick Hotel (Allen, Crufts, and Thayer had acquired the land in 1871 and in March of 1872 had received legislative approval of a corporation, the Proprietors of the Huntington House, “for the purpose of owning and maintaining a family hotel,” to be located on the corner of Boylston and Clarendon Streets; they subsequently did not build the hotel, possibly because of financial hardships created by the Boston fire of November 9, 1872). It appears that, after they acquired 64 Commonwealth, the house was unoccupied for several years. On April 19. 1875, Isaac Cruft transferred his interest in the property to Charles Allen. They continued to live at 64 Commonwealth during the 1880-1881 winter season, after which they made Revere their year-round home. On February 23, 1881, 64 Commonwealth was purchased from Charlotte Farnsworth by Mary Fletcher (Horton) Pierce, the wife of Charles Wilder Pierce. They previously had lived at 11 Union Park. Charles Pierce had been a dry goods merchant in partnership with his brother, Carlos Pierce. By 1872, he had become secretary and treasurer of the Atchison, Topeka & Santa Fe Railroad. He had retired by 1880. During the 1884-1885 winter season, they were joined at 64 Commonwealth by Charles Pierce’s brother-in-law and sister, Gordon L. Goodwin and Julia (Pierce) Goodwin. They had lived at 19 Union Park in 1880. He was assistant treasurer of the Santa Fe Railroad. By the next season, they had moved to the Hotel Brunswick (southeast corner of Boylston and Clarendon). 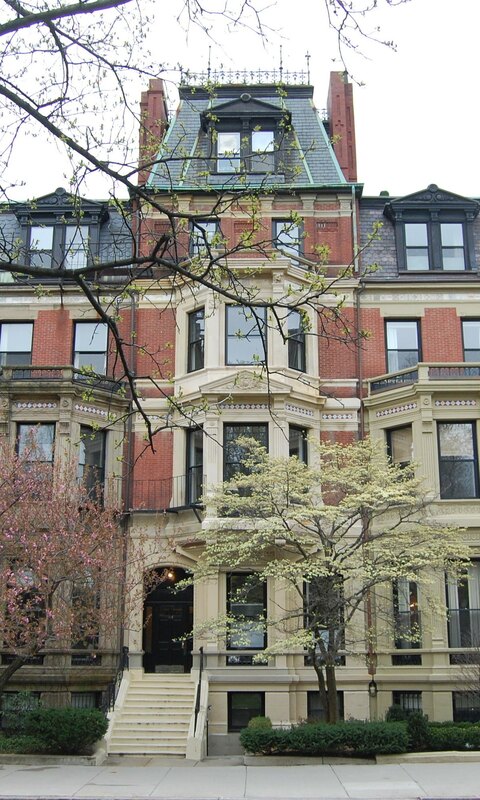 The Pierces continued to live at 64 Commonwealth until his death in April of 1889. After his death, Mary Pierce and their unmarried daughter, Elizabeth Frances Pierce, moved to Washington DC to live with Mrs. Pierce’s brother-in-law and sister, Elijah Caleb Foster and Judith Ellen (Horton) Avery Foster. Judith Horton Foster was an early woman lawyer and a leader of the Women’s Christian Temperance Union; Elijah Foster was a lawyer and judge. Mary Pierce also maintained a home, Sunnyside, in Stanstead, Quebec, where Charles Pierce had been born. Mary Pierce continued to own 64 Commonwealth and lease it to others. On February 2, 1894, she transferred it to her daughter, Elizabeth Pierce. By the 1889-1890 winter season, 64 Commonwealth was the home of retired shoe and leather dealer Daniel Harwood and his wife, Sophia (Wardwell) Harwood. They also maintained a home in Hingham, which previously had been their primary residence. Living with them was Samuel W. Greene, a teller at the Atlantic National Bank, who previously had been a lodger at 249 Berkeley. They continued to live at 64 Commonwealth in 1892, joined by Mrs. Abby S. (Bangs) Dennis, the widow of Samuel James Dennis. By the 1892-1893 winter season, the Harwoods, Mrs. Dennis, and Samuel Greene had all moved to 381 Commonwealth. By the 1892-1893 winter season, 64 Commonwealth was the home of Miss Catharine Jane Chamberlayne. She was the founder and principal of Miss Chamberlayne’s School for Girls, which she operated at 64 Commonwealth. 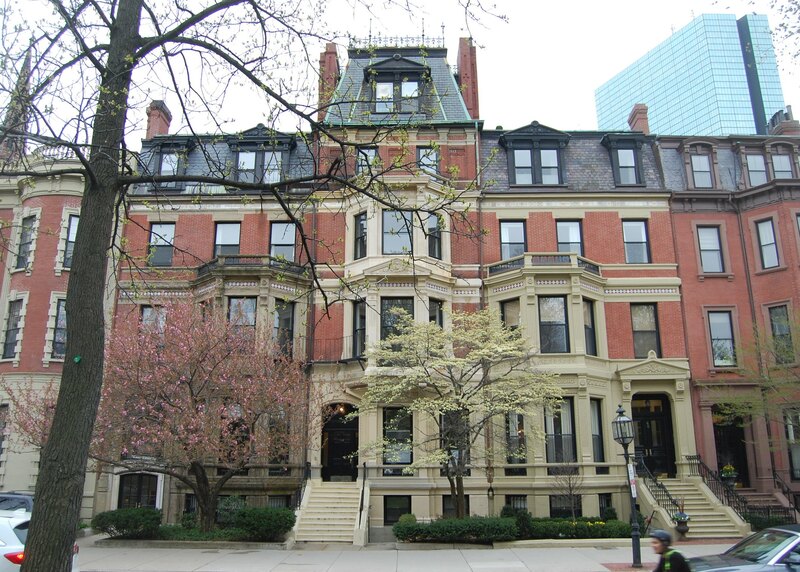 She continued to live at 64 Commonwealth during the 1895-1896 winter season (joined by Miss Mary E. Tappan), but moved thereafter to 253 Commonwealth. During the 1896-1897 winter season, Mary (Horton) Pierce was once again living at 64 Commonwealth. She was no longer listed there in the 1898 Blue Book, and probably had returned to Washington DC. During the 1897-1898 winter season, it was the home of George Adelbert Alden and his wife, Harriet (Hadley) Alden. They previously had lived at the Hotel Vendôme. They also maintained a home in Needham. George Alden was a shipping merchant dealing in rubber, goat skins, cocoa, and other commodities. By 1899, they had moved back to the Vendôme. 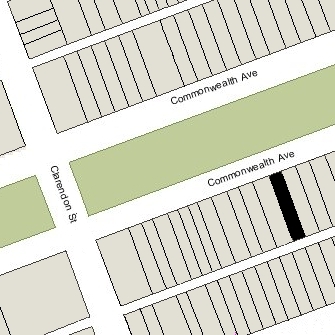 At about this time, 64 Commonwealth appears to have become a multiple dwelling, with two or more residents listed there in the Blue Books in most years. Mary (Horton) Pierce died in November of 1903. Elizabeth Pierce continued to live in Washington DC. Elizabeth F. Pierce continued to own the house, however, and to lease it to others. On August 12, 1914, 64 Commonwealth was purchased from Elizabeth Pierce by Arthur Merton Hazard. He was a portrait and landscape artist, and established his studio at 64 Commonwealth. He and his wife, Julia Hazel (Closterhouse) Hazard, lived in Brookline. In addition to serving as his studio, 64 Commonwealth also continued to be multiple dwelling (probably a three family dwelling) and medical offices. On December 8, 1923, 64 Commonwealth was acquired from Arthur Hazard by Charles J. Donovan, and on December 23, 1923, it was acquired from him by Elsie (Malkus) White Keller, the wife of Boston Symphony cellist Joseph Keller. They lived at 535 Newbury. On January 20, 1925, 64 Commonwealth was acquired from Elsie Keller by Edwin Lyons. It continued to be a multiple dwelling. On April 30, 1929, Arthur F. Baker foreclosed on his second mortgage to Edwin Lyon and took possession of the property, transferring it to A. F. Baker & Co., Inc., and on April 28, 1931, the Columbian National Life Insurance Company foreclosed on its first mortgage took possession from A. F. Baker & Co.
On September 14, 1943, 64 Commonwealth was acquired from Columbian National by Thomas Lucey , who operated a building maintenance company at 30 Joy. On the same day, he conveyed the property to William Weisberg, a real estate dealer in Dorchester. The deed was not recorded until January 2, 1962, however, when William Weisberg sold the property, and therefore Thomas Lucey remained the assessed owner until then. The property subsequently changed hands and on September 25, 1964, was acquired by telephone company executive Frank Henry Rowland, Jr., and his wife, Rose Julie (Cunningham) Rowland. They lived at 297 Marlborough. On June 3, 1977, 64 Commonwealth was acquired from the Rowlands by John J. Campbell, trustee of the Commonwealth Realty Trust No. 64. On July 14, 1980, he transferred the property to John J. Campbell, Jr., and on October 24, 1980, it was purchased from him by Charles R. Laverty, Jr.
Over the previous decades, the number of units at 64 Commonwealth had been increased to eleven (permits for the remodeling are not included in the Building Department’s on-line files). On October 27, 1980, Charles R. Laverty, Jr., converted 64 Commonwealth into eleven condominium units, the 64 Commonwealth Avenue Condominium.